Working for years in our areas of expertise, we make assumptions about the level of jargon others are familiar with. My goal with City Survivor has been to make sort of a beginner’s guide to supplements, a range that’s simple to understand. It’s tricky because ingredient names on supplement packaging are mainly incomprehensible. So, part of my blog is a series on “Ingredients Matter”, looking at nutrient forms, functions and quality issues you should be aware of. This week I decided to look at antioxidants, since they’re part of Pollution Protection. I don’t remember knowing the term antioxidant at all before studying nutrition but nowadays it’s used a lot in food and skincare branding….. but what does it actually mean for you? The internet generally says something along the lines of “Antioxidants protect your body against oxidative damage by neutralising free radicals” which is pretty meaningless if you also don’t know what oxidative damage or free radicals are. Disappointingly, Free Radicals does not refer to people living off the grid in 1967. Recall your vague and ancient memories of chemistry lessons - remember the visual of molecules having little solar systems of electrons? Free radicals are molecules with unpaired electrons, which makes them very reactive. They ping around stealing electrons to make themselves stable. But, in stealing electrons, they make the victim-molecule unstable in turn! This cycle can damage important lipids and proteins, harming cells and DNA. Luckily, we have antioxidants - who generously have electrons to spare - that stop the cascade of electron-theft and damage. So, if there’s an imbalance of the free radical : antioxidant ratio, there’s a risk of oxidative damage. As well as contributing to all disease development, oxidative damage is what ruins your ageing skin: premature-ageing, sagging, wrinkling. Maybe I sound vain, but being about to turn 35 and in the absence of any serious health problems, this is currently more of a worry to me than whether or not I’m getting dementia and diabetes later. OK fine, it makes me sound vain AND stupid, but the importance of antioxidants is the same for avoiding diseases or wrinkly necks, so read on. 💪🏽 the body’s own processes - waste from making energy (oxygen itself is highly reactive), fighting pathogens etc. 💊 environmental inputs - pollution, cigarettes, alcohol, pesticides, certain drugs such as paracetamol, processed vegetable oils, U.V. damage. But, we can increase our antioxidant intake and try to minimise our exposure to pollutants. Nutrients that work as antioxidants include Vitamin C, Vitamin E, Carotenes, Selenium and Zinc. We get a lot from food and some are created in the body, such as Glutathione. We need a huge complex of them; some antioxidants prevent free radical formation, others scavenge active radicals, and some even recycle other antioxidants! That means that your city lifestyle otherwise consisting of booze, cigarettes and takeaways can’t be counteracted by vitamin C tablets alone!! 🍑 Eat more and varied colourful vegetables and fruits (yes, this advice applies to literally every health article. Boring but true). 🐮 If you eat meat, choose high-quality grass-fed, not grain-fed. 🍟 Avoid processed vegetable oils (sunflower, rapeseed, margarine etc) - processing means they’re already rancid. Extra virgin olive and coconut oil are good for the kitchen. Cold pressed nut and seed oils are great for salad dressings if you buy in small containers, store cold and dark to avoid rancidity, never heat them up (I’m planning a proper post soon to discuss oils in more depth). 🛀🏾 Reduce chemicals wherever possible: you’re already bombarded with pollution so why add more in your own home? Look at more natural versions of your cleaning, laundry, and cosmetic products. Given the realities of normal life (pollution, being sometimes too tired to cook, drinking alcohol, being pale and getting sunburnt etc), I think it makes sense to use antioxidant supplements in addition to the above. Pollution Protection is so named because I use a broad complex of antioxidants in addition to a general vitamin/mineral complex. Maybe it’s down to good genes (thanks, Mum), but people often think I look younger than my years so I think damage limitation tactics are doing some good. Thanks for being here! If you want to read more about Pollution Protection you can hop over to the main site. PPS - 🚬 On the subject of Ingredients Matter: check out another post of mine about Beta-Carotene. This antioxidant is so effective in the body, trials were done with smokers. They didn’t have the expected outcome! 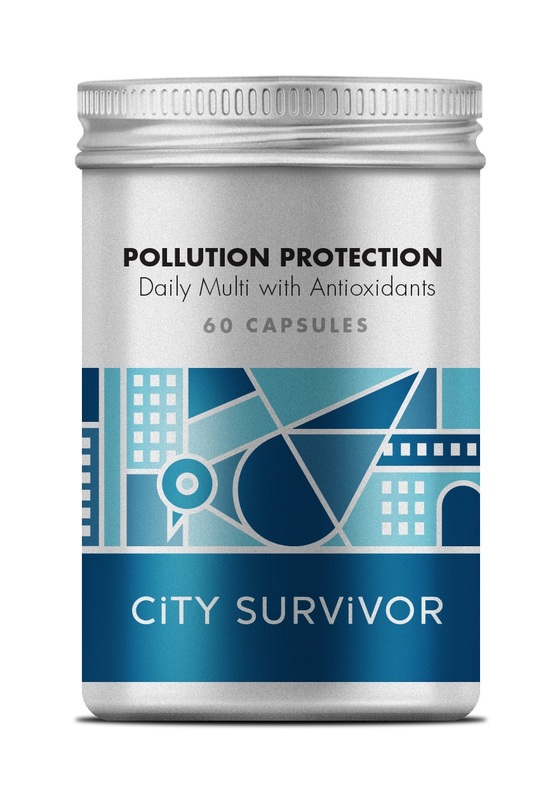 City Survivor only contains safe, natural carotenes.